Luka has travelled to over 50 countries around the globe and has plenty more on his ‘go to’ list. Somewhere along the way a passion for photography took over; what started as an enjoyable hobby became a way of life and he has established himself as one of the leading landscape photographers in Slovenia as well as an expert in running photography tours and workshops in his home country, Bosnia, Croatia, Montenegro and the wider Adriatic region. Luka Esenko said hello to me at the Photography Show last year and showed me a beta design of his SNAPP location guides. He's a talented photographer in his own right though and his work from his home country of Slovenia is well worth spending some time with. I graduated from the University of Ljubljana in Management studies - no connection to photography! My first exposure to photography was through my dad who is a life-long photographer. Even if I wasn’t taking photos myself, I was intrigued by his darkroom and often accompanied him when he was developing film. I still vividly remember his (now very cool retro looking) Practica and Nikon cameras and the smell of the chemicals for developing. I am proud that my images convey the beauty of my home country and hope that my images inspire people and make their day a little brighter. The single most important moment was when I decided to focus on landscape photography and to eliminate the gear I did not really use. From then on it was clear what my photography goals were; I still do portraits, wildlife and travel photography but for fun. This happened about 4-5 years ago. As a result, I think I have developed a simpler, more personal style of photography. Now I want to grow as a photographer but don’t feel the need to compete with others for approval or popularity. I started my working (or rather entrepreneurial) career in the travel industry, where I still operate in some way with my photo workshops. My dad had a huge influence on my early passions too - he is an expert naturalist and author of many books on birds, wildlife and sustainable gardening. I grew up with this and am still involved in volunteering for Birdlife Slovenia. These two influences from my childhood and professional life both combined to give me a love of travel; most of the time to national parks or wild places. When I travel, locally or abroad, landscape photography is my main mission and gives me a reason to travel. Ever since I can remember I’ve enjoyed being outdoors in nature. I always loved the challenge of climbing a mountain or exploring a wild Alpine river and this is still the same today. Beautiful places of nature are where I find connection a with the world. To observe, to experience these places and to photograph them is my biggest passion. My main camera is a Nikon D800 which is now very battered and scratched and probably at the end of its life cycle. But it does the job - I know it very well and I trust it. If I am climbing in the mountains I only take two lenses with me; a 16-35 and 70-200, both f4 Nikon lenses. For less physically demanding trips I will carry Nikon’s f2.8 lenses, 14-24, 24-70 and 70-200. These lenses allow me to do most of my work in photography. They’re very reliable and have good optical quality. I only wish the setup was a little less heavy. What sort of post processing do you undertake on your pictures? Give me an idea of your workflow? All my images go through Lightroom where I do keywording, culling and basic editing. I edit my final selection in Photoshop where I sometimes use luminosity masking techniques for blending multiple exposures. I do like Nik software plugins, especially Viveza and Colour effects. I wish I printed more of my work. My home and my office are small and already full, and I don’t really focus on selling prints. When printing I use a local lab, here in Ljubljana, where we can make small sample previews before making bigger versions. Self-motivation is the biggest drive but there are many photographers I look to for inspiration. I was lucky to work with some leading photographers on my workshops, Jeremy Woodhouse, Sean Bagshaw and Jonathan Chritchley are some that I learned a lot from. I also like to look at the work of photographers like Ansel Adams, Henri Cartier-Bresson, Gregory Heisler, Josef Koudelka, Vivian Maier - but as you can see none, except Ansel, are landscape photographers! Can you choose 2­ or 3 favourite photographs from your own portfolio and tell us a little about them? A beautiful sunny day, with gentle winds and white fluffy clouds - who wouldn't want to be in that boat? This image works for me for multiple reasons, I love the repetition; two sailboats, two layers of clouds, two gaps in the clouds above each boat. The boats are silhouetted nicely against a highlighted sea, and I like that the composition remains simple, despite the many elements in the frame. As I was descending the Mangart peak after a sunrise shoot I was struck by the beautiful layers of the Alps in this view. To make this image work I included two key things - the ridge with the golden grass in the foreground for colour contrast and a person to give a sense of scale and adventure. There was fresh snowfall in the Alps the night before and I knew the visibility would be great. My intention here was to contrast the stark, inaccessible snow-covered Alps in the background with the gentle landscape and hilltop church in the foreground. The “spotlight” on the church emphasises this even more. Photography is my work, but running workshops is demanding and I spend most of my time out focusing on my clients. Now and again there’ll be an opportunity to get an image that means a lot to me and this is very rewarding. The biggest challenge nowadays is my family - I can’t just disappear into the mountains for a few days anymore! It just takes a bit more planning and consideration now. How do you like to approach your image making? Do you pre­-plan and go out with something in mind, or do you prefer to let your photography flow from your explorations on foot? I do both. But even when I pre-plan I end up with different images than I expected. Which is a good thing - it’s important not to limit yourself to what you have pre-imagined and be open to opportunities that the environment presents. I do prefer not to plan too much, but as my time is usually limited, I want to maximise my days out. So usually I plan for weather, location, time of day and then once on location I try to go with a flow. Hiking, climbing, kayaking and camping somewhere in nature. I’d make the most of being outdoors without a heavy camera backpack! Often there are times when I need to focus on my business or there are family matters so photography has to take second place. After a certain time though I start to feel an itch - a desperate need to go out with my camera and do what I love. I don’t find it difficult to get back into a creative mindset - sometimes just seeing beautiful light is enough to start me visualising a shot. As mentioned above, not often enough. Most of the time I do printing in a local lab in Ljubljana and have experimented with different papers and with canvas. I would love to try other materials such as aluminium or glass. I’d like to explore BW photography more. I am constantly trying to make images more simple, and at the same time more thought-through. These are my two current directions, but who knows what the future will bring. It is good to keep your mind open to everything new. You’ve recently been working on a project creating location guides, can you tell us a little more about how you got into this. I do a lot of research and planning for my trips, especially for new destinations, and I was always looking for something that would simplify this process, save me some time and pull all the info together in once place. My business partner, Jules, is an amateur photographer, and she wanted something that would help her discover new places to photograph - nearby or when on family trips - to help her get the best out of the limited time she has for photography. When we put these ideas together and discovered that there really wasn’t anything like it out there on the market, we came up with SNAPP Guides, a photography location finding app with destination guides dedicated to the needs of photographers. We’ve just launched in the App Store (and it will soon be available on Android), and will regularly be adding to our collection of guides created with photographers from around the world. 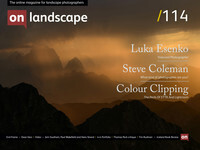 We’d value feedback from OnLandscape readers once they’ve tried it as our aim is to make it the go-to tool for photographers. You can download SNAPP Guides and try it here. Which photographer(s) – amateur or professional ­ would you like to see featured in a future issue? Since I am from Slovenia I’d suggest Dan Briški, my colleague and one of the most talented young photographers in Slovenia. His mountain landscapes are stunning. And the second is Jure Kravanja, one of the most accomplished photographers I know. His social media accounts: Facebook, Twitter & Instagram.